The Common Core State Standards for Mathematics (CCSSM) include overarching Standards for Mathematical Practice that cite dynamic geometry® software as one of the tools mathematically proficient students should know how to use strategically. Dynamic geometry software or more generally, dynamic mathematics software, provides visible and tangible representations of mathematical concepts that can be dragged and manipulated to discover underlying properties, investigate patterns and relationships, and develop deeper understandings of the concepts. The Geometer’s Sketchpad®, TinkerPlots®, and Fathom® are examples of dynamic mathematics software. 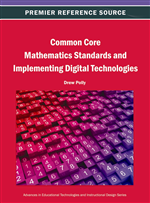 This chapter outlines how dynamic mathematics software supports the CCSSM. Specific mathematic content examples are described using these three resources to model the use of dynamic mathematics software for learning mathematics. Challenges for successfully integrating dynamic mathematics software are described with suggestions for training and support. The Common Core Standards for Mathematics (CCSSM) (National Governors Association Center for Best Practices (NGA Center) and Council of State School Officers (CCSSO), 2010) include both content standards and pedagogical practices to support teachers in developing mathematical proficiency in their students. Dynamic geometry® software is one of several tools that are referenced to help support the standards. This chapter outlines three specific dynamic geometry tools, or more generally, dynamic mathematics tools that are well known in mathematics education: The Geometer’s Sketchpad® [Sketchpad] (KCP Technologies, 2011b), TinkerPlots® Dynamic Data Exploration (TinkerPlots) (University of Massachusetts, 2005–2012), and Fathom® Dynamic Data (KCP Technologies, 2011a), discusses their overall design, and gives specific examples of how they can be used strategically in elementary, middle, and high school mathematics. I also provide suggestions for implementation and teacher training, because the success of any new resource or strategy requires planning and support. Mathematically proficient students consider the available tools when solving a mathematical problem. These tools might include pencil and paper, concrete models, a ruler, a protractor, a calculator, a spreadsheet, a computer algebra system, a statistical package or dynamic geometry software. Proficient students are sufficiently familiar with tools appropriate for their grade or course to make sound decisions about when each of these tools might be helpful, recognizing both the insight to be gained and their limitations (NGA Center and CCSSO, 2010, p. 7). In the classroom, when a student is given a simple calculation, paper and pencil may be the most appropriate tool. However, if multiple calculations are required to arrive at a solution, a calculator might be a more appropriate tool. For demonstrating the effect of a specific coefficient on an equation and its graph, dynamic geometry software is the most appropriate tool because of its ability to plot functions with dynamic parameters for the coefficients. These dynamic parameters can easily be increased or decreased one at a time, or they can be used to create a visual representation of a family of functions. They allow students to quickly see multiple examples of how a specific coefficient affects the behavior of the function, thus allowing them to “visualize the results of varying assumptions” (NGA Center and CCSSO, 2010, p. 7) (Figure 1). The term “dynamic geometry software” was originally used in 1990 (Jackiw, 2009, p. 5) by the designer, Nick Jackiw, and publisher, Steve Rasmussen, of The Geometer’s Sketchpad (KCP Technologies, 2011). Dynamic geometry describes the ability of Sketchpad to drag “mathematical images through an infinite number of continuously related examples all sharing the same mathematical definition used to construct them” (Jackiw, 2009, p. 4). Since that time, the term has come to represent “rapid expression, continuous and interactive direct manipulation, and the tangible experience of the consequences of variation” (Jackiw, 2009, p. 5). Dynamic geometry software is important for mathematical visualization for all grade levels and for all mathematical concepts because of its ability to “infuse that mathematics with life, movement, and mathematical behavior” (Jackiw, 2009, p. 5). The ability to dynamically drag objects to compare and discover relationships is what makes dynamic geometry software a powerful mathematical learning tool, since, according to Finzer and Erickson (1998), “the learning takes place during the drag”.